I’m currently engaged in a long-term quest to acquire every single item in Frank Shuffelton’s epic Thomas Jefferson: A Comprehensive, Annotated Bibliography of Writings About Him, 1826-1997. Frank Shuffelton, as some of you may already know, was a professor of English at the University of Rochester, compiler of the above bibliography as well as editing an excellent edition of Jefferson’s Notes on the State of Virginia and the recent Cambridge Companion to Thomas Jefferson, and a member of the ICJS Advisory Board. He was also a very nice man – I met him once for 2 minutes over a cheese plate at the 2004 launch of the new Papers of Thomas Jefferson: Retirement Series. When the Jefferson Library was just a little baby library, we used Frank’s bibliography to jump-start our online catalog, loading all of the citations into it. Frank died earlier this year, but we’re carrying on his Jefferson bibliographizing here. We’re pretty on top of the recent stuff about Jefferson, but for older stuff, we sometimes just have a citation in the catalog and no holdings; that’s the stuff that I’m filling in now. So this is the first in a running series of Amusing Shuffelton Items. 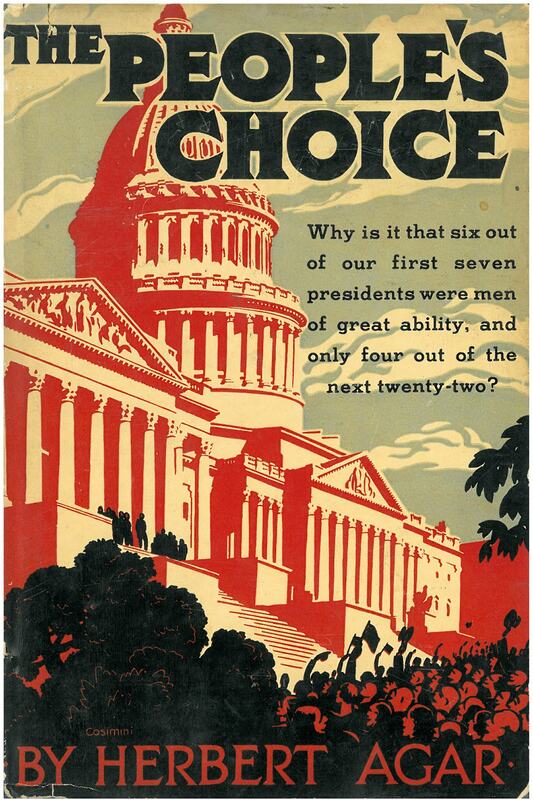 Item #1 is a book called The People’s Choi ce, by Herbert Agar (Riverside Press, 1933). Herbert Agar, we learn from the Internet, was “an American journalist and editor of the Louisville Courier-Journal.” This book also won the Pulitzer Prize for History in 1934. Hmmm. Anyway, I managed to get a copy that still has its dust jacket, which is fortunate because this one is pretty awesome: check out those 1930s-vintage graphics! “No important change”?! Whatever, Herbert! As you will have divined from Frank’s summary, Mr. Agar is a man of strong opinions. Witness the question posed on the cover, which seems to be the result of Mr. Agar’s very strong opinions combined with some oddly precise math. Seriously, I poke a little fun at Mr. Agar’s convoluted ranking, but his comment actually puts me in mind of Jefferson’s own famous comment, speaking of his daughter, that “the chance that in marriage she will draw a blockhead I calculate at about fourteen to one…” I would love to know what kind of analysis led to that oddly precise math…but that’s for another blog post. 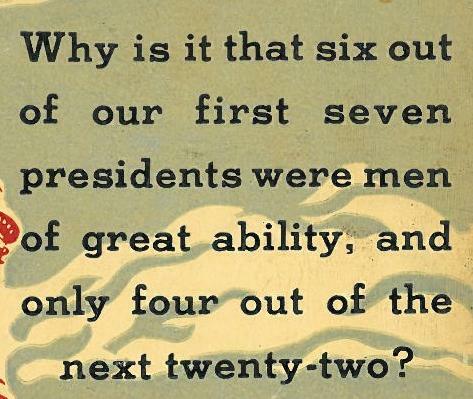 One wonders – which of the first seven presidents did Mr. Agar consider, in Mr. Jefferson’s words, a blockhead? You know, it was difficult to tell right away, but after some furious skimming I have to say that he really seems most negative about Jefferson. He does seem to see Jefferson through the lens of Hamilton, for some reason, which explains a lot! Funny! I remember laughing out loud when reading the letter that quote came from, I can’t recall to whom he was writing when he made that calculation. Agar regards the first presidents as part of an oligarchy, Howard Zinn understood the founding fathers this way as well. If I remember correctly, Zinn didn’t understand the election of 1800 as a “revolution” either. I, as a TJ partisan, regard his election as the greatest democratic expression in our country’s history, but I am very romantic and not to be taken seriously! The book I like from this time period is “The Living Jefferson,” by James Truslow Adams. This is an easy and affectionate read for those of us who daydream all things Jefferson! “Blockhead” came from a 1783 letter to Marbois, Secretary to the French legation, whom Jefferson noted had provided a reading list for his 11-year old daughter Patsy. Sadly, that item has not been located. He later expanded his list of spousal inadequacies to include “lost, incapable, or inattentive”. We wonder which of the two son-in-laws he had in mind!